Our second day in San Francisco was the only one with a pre-planned agenda: lunch with my friend Erin Fae, then dinner with friends from college. Fearing the vagaries of changing hotels and public transit in a new city, I had planned our day down to departure times – which paradoxically made having a relaxing breakfast easier. 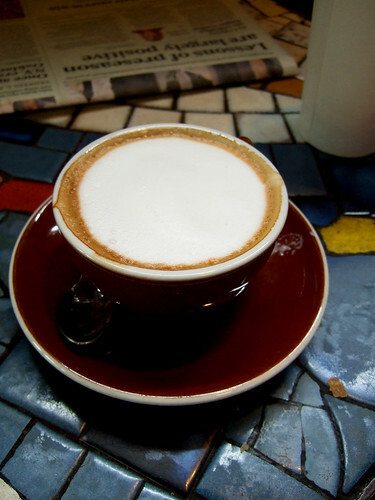 On Heather’s recommendation, we set out in search of coffee and Italian pastries for the authentic North Beach experience, ending up at Caffe Trieste. Like Mama’s, there was a line and few tables available – but unlike Mama’s, most of the people in the fast-moving line seemed to be commuters in search of their morning cuppa and a bite to eat. I’m not sure how best to describe my breakfast. What would you call this thing? 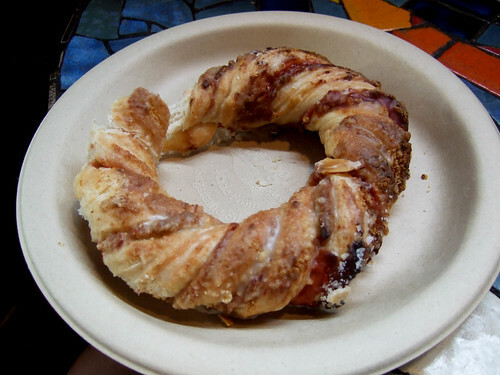 It was about the size of a bagel, flaky on the outside but a little chewy on the inside, drizzled with a simple sugary glaze and with some sort of raspberry jam twisted irregularly throughout. 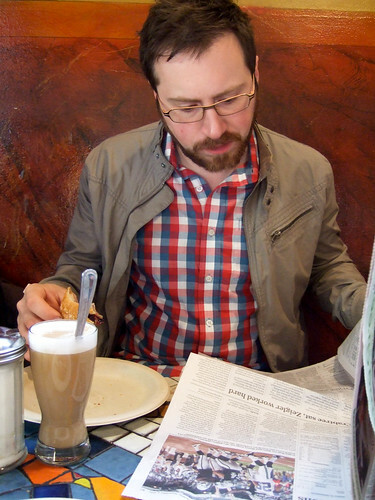 Shane had a bear claw of sorts, and we both enjoyed our coffees and a newspaper. As we were getting ready to leave, a woman sat down at the next table and asked if we’d ever plugged our laptops into a particular socket. Of course we hadn’t, but this interaction made us feel slightly less like tourists. Hooray! Once back at the hostel, we piled on the luggage and headed to our second residence of the trip – the Four Seasons. As someone later commented, we’re probably the only people to have ever stayed at the Green Tortoise and the Four Seasons in the same trip. We expected to just drop our luggage, but our room was already ready (at 10am! ), so instead we dropped our luggage in our fancy room and headed out to catch the Geary bus to Inner Richmond. 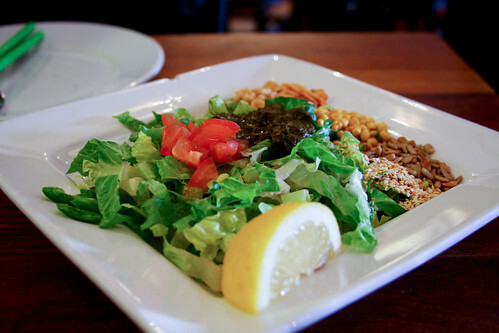 After a brief tour of the plate – lettuce, tomato, sesame seeds, chips of fried garlic, fermented tea leaves, and too many peanuts for Shane’s taste – the salad is tossed up at the table. Side note: we recently watched Follow That Bird, and now whenever I hear ‘tossed salad’, I picture the Grouch diner with Sandra Bernhard. But I digress. The salad was delicious, as was the rest of our lunch. I mean, look at Erin’s delighted face! Erin had the eggplant with garlic sauce – a surprisingly luxurious dish with eggplant that nearly melted away into the tomato-garlic base. I tried a tofu and black bean dish served over Burmese fried rice – I didn’t love the rice, but I did love the nutty tofu. We really need to make more tofu at home, you guys. Shane really enjoyed his duck noodles, though I can’t remember much about them other than that he ate them right up! Erin had two other destinations in mind for our jaunt out to Inner Richmond – Green Apple Books, which she described as SF’s answer to NYC’s Strand – and one of those Asian free-for-all stores packed from floor to ceiling with all manner of merchandise, most importantly socks! Socks of all shapes and colors and sizes! I exercised considerable restraint and only came home with one pair – black with pink stars. By the time we wrapped up our lunch and fun errands, Erin had to attend to important Moving! To New Zealand! In Two Days! business, so we parted ways with lots of hugs. Shane and I walked around Geary for a while longer, then headed back to our hotel to rest up before meeting Heather and Blaze for dinner. 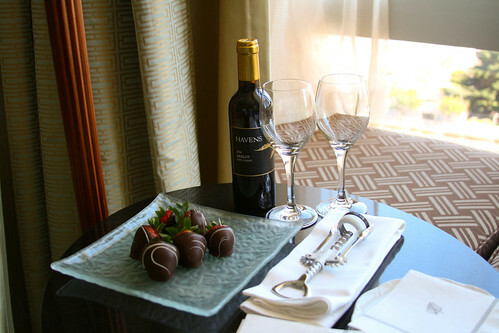 When we got back to the hotel, we found a lovely honeymoon-y surprise! Bring cash, and don’t bring your laptop. A lovely hotel experience, but only really worth it if someone else is paying. Put your shoes out at night for the free shoeshine. The tea leaf salad isn’t overhyped. I wish we’d been able to go back for another meal or two. Huge used-and-new bookstore. Don’t miss the fiction and music annex next door! I looove burma superstar. 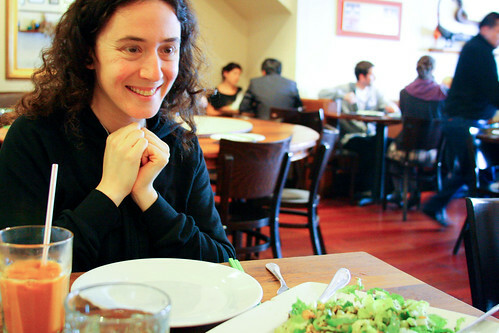 when i suggested the tea salad mary was like, “uh why are you ordering SALAD that’s retarded.” and i told her everyone recommended it. and it came and it really was just lettuce salad. we were so disappointed with it! I mean it was good for salad but it was just a salad. Everything else on the other hand was awesome.